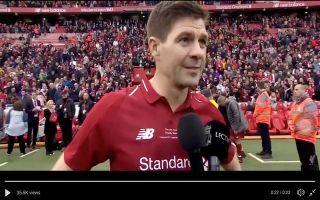 Steven Gerrard won the hearts of Liverpool fans all over again this afternoon with his brilliant performance and his heartwarming post-match interview. Gerrard rolled back the years with a sensational performance during Liverpool Legends’ match against AC Milan Legends, the current Rangers boss sent fans into a meltdown when he scored a superb solo goal in the last minute to seal a win for the Reds. To make the goal even more special, it was right in front of Liverpool’s thunderous Kop. Check out Gerrard’s sublime winner here. Gerrard also revealed that he was keeping one eye on Liverpool’s heated title race with Manchester City, the 38-year-old expressed that he’d be the “happiest man in the world” if Jurgen Klopp’s side can win the Premier League this season. It’s amazing to see the special bond that Gerrard has with Liverpool and fans will be hoping that their current stars can bring them the success that the former England international did.